1640 A.D. — a ghastly curse befell a beautiful island in the Indian Ocean. 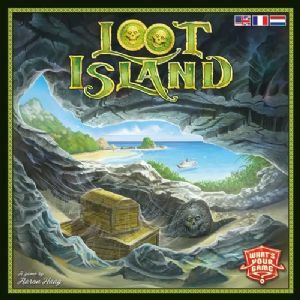 Soon, it was known that its dark magic would not only afflict whoever tried to take away anything from the island, but also haunt whoever even dared approach its coasts, making it the perfect location for pirates to hide their loot. 1902 A.D. — centuries later, pieces of ancient treasure maps were found by you and your fellow treasure hunters. Do you have the correct pieces of the map? Do the other players have matching pieces to help you find a route to the treasure? And...will you be able to get rid of the curse?